Our Chiang Mai experiment has ended. 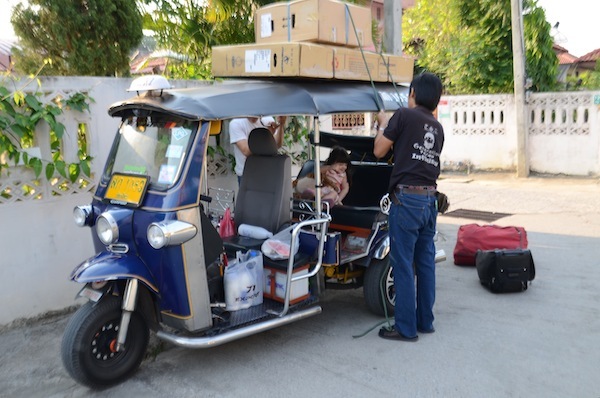 We have packed up our house and left Thailand’s “rose of the north”. Miss M and I are heading for France via Cairo. Darling Man is heading back to Vietnam to try to get his Schengen visa so he can join us. There is a tent and a field camping set in my luggage. I am lugging this extra weight around in the hope that our family is reunited in Provence and we do set off on our cycling and camping adventure. However, Darling Man is not confident he will get a visa. He says that his lack of a job will weigh heavily against him when his application for a visa is assessed. I remain hopeful. SURELY the bureaucrats will see we are a family and we have no reason to stay in France after our holiday. We don’t even speak French! There are so many things I will miss about Chiang Mai. I will miss our local market. I will even miss the strange stink we drive through between the little khao soi restaurant and the market. I’ll miss all the street dogs we passed as we zipped along Fa Ham Road. There was the white one with the bung leg that spent most of the day napping in the sun and the old grizzled black dog who slept in the middle of the road (heaven knows how he lived to such a ripe old age). I’ll miss taking Miss M for a ride along the Ping River, stopping to check whether the various fishermen had caught anything. I’ll miss the tuk-tuks and our rented motorbike. I’ll miss the food, too. Oh, how I’ll miss the food. Thanks for everything, Chiang Mai. I hope to see you again soon. We’ll be back! And we have a wedding in Singapore later in the year, so we might actually get to catch up again, Kristy. I’m going to miss your food photos! I’m hoping to keep bringing you food posts, Stephanie. Don’t worry, food is still a major obsession for me. Good luck with everything Barbara, I have my fingers crossed for you all. Thanks, Snap. We have our fingers and toes crossed! I, too, am hoping it all works out for you and your family. Thanks for sharing so much about Chiang Mai and Thailand. Can’t wait to see the photos from France! Thank you Linda! I really loved Chiang Mai. I hope we get back there soon.